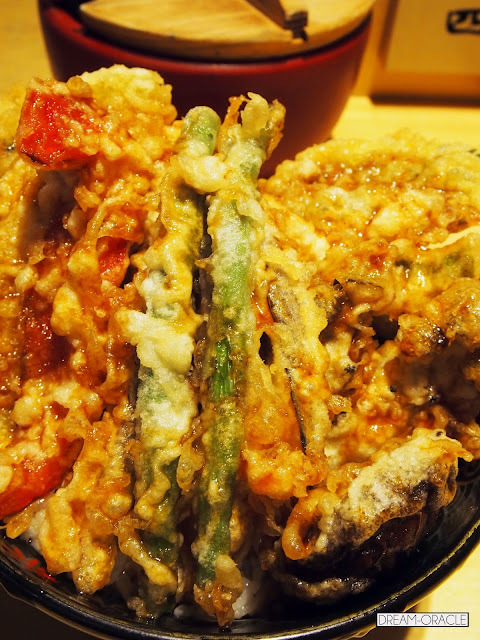 I am super excited to write about this because people who know me know that I am quite nuts about tendon, just check out how many tendons I ate while in Japan. Many Japanese restaurants in Singapore serve some form of rice with tempura that they called tendon, but its utter blasphemy to call those pathetic bowls of overfried food a tendon. It's far from the real thing. 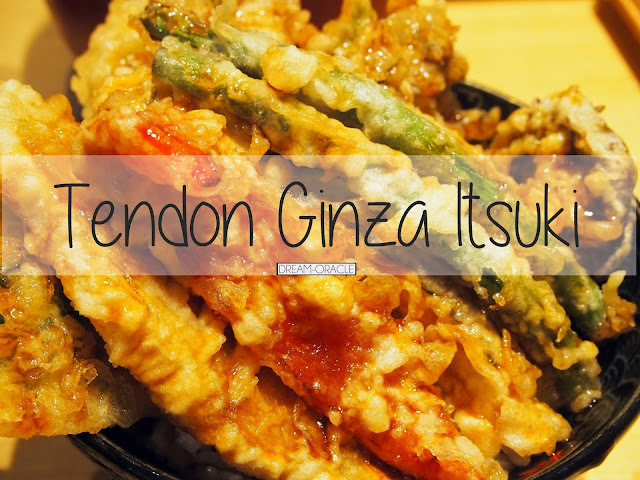 Ginza Tendon Itsuki is the first tendon restaurant in Singapore and they only serve tendon. 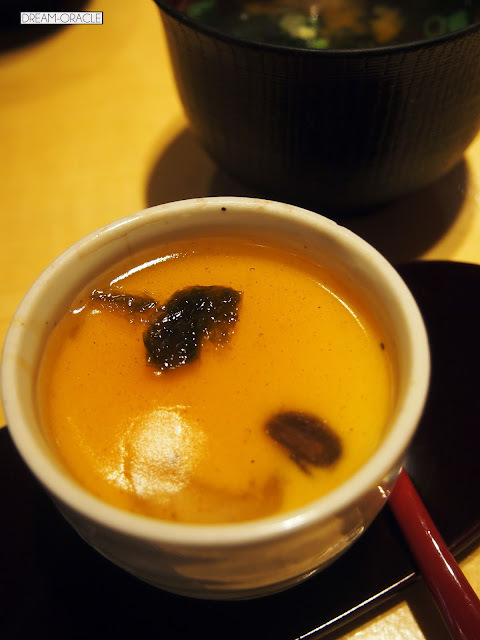 All set meals come with a bowl of miso soup and chawanmushi. And typical of all Keisuke shops, there's a palette cleanser of seasoned vegetables on every table. Feel free to eat your fill. There are only two types of tendon - the Special or Vegetable. Either you eat meat or you go veg, very easy to decide. The Special comes with 2 very big prawns, 2 pieces of chicken fillet some long beans, binjal and other assorted vegetables. Oh and a tempura onsen egg! Honestly, the chicken fillets felt kinda out of place here, tendon places in Japan usually use fish but that might drive the costs up. If the chicken fillet was well done, it probably would not feel so weird, but it also tasted kinda bland. I really think fish or squid would be a much better choice. This Vegetable tendon was a delight to devour, and the special bowl kept the food warm right to the last morsel, perfect for super slow eaters like me. The sweet tempura sauce was pleasantly compatible with the grains. I especially love long beans tempura! Bell pepper still tasted sweet and brinjal is oh so crisp on the outside soft on the inside. Yums! There's no right or wrong, simply which kind of tendon you prefer. 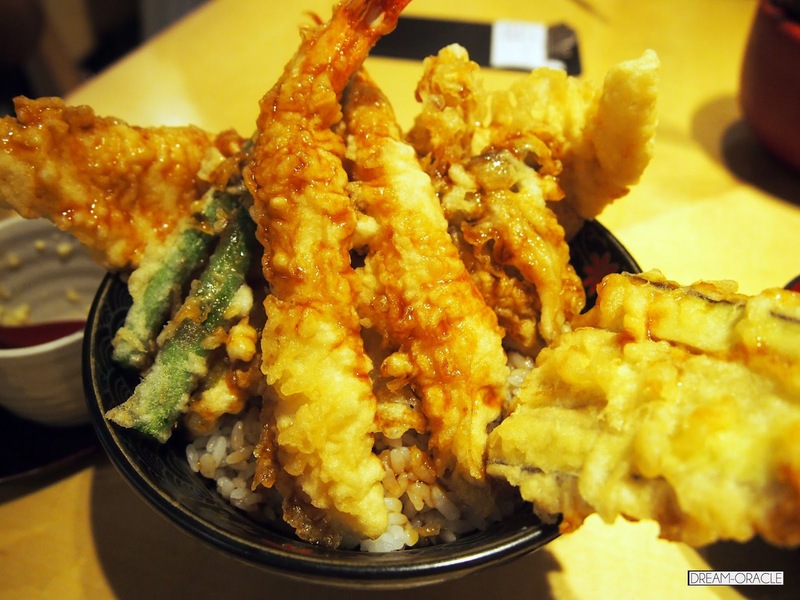 I usually like my tempura light and crispy like how Tsunahachi does it, but variety is good. This is definitely a bowl of soul food that I can keep returning for. Thumbs Up: The value-for-money proportions! To Improve: VENTILATION!! I smell like a walking piece of tempura after dinner. Will I return: Oh yes definitely! Why: Still the best tendon in Sg so far!